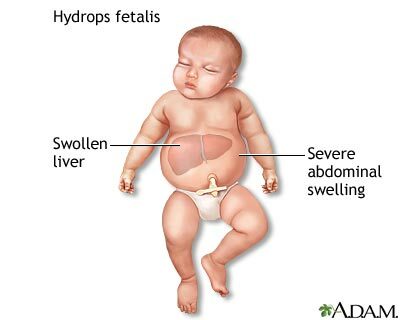 Hydrops fetalis (fetal hydrops) is a serious fetal condition defined as abnormal accumulation of serous fluid in two or more anatomic compartments, such as skin, pleura, pericardium, peritoneum. In some patients, it may also be associated with polyhydramnios and placental edema. Several hypotheses regarding the pathophysiologic events that lead to fetal hydrops have been suggested. The basic mechanism for the formation of fetal hydrops is an imbalance of interstitial fluid production and the lymphatic return. Fluid accumulation in the fetus can result from congestive heart failure, obstructed lymphatic flow, or decreased plasma osmotic pressure. The fetus is particularly susceptible to interstitial fluid accumulation because of its greater capillary permeability, compliant interstitial compartments, and vulnerability to venous pressure on lymphatic return. Alpha thalassemia is one of the most common nonimmune anemia and it is responsible of a particular form of hydrops fetalis called Hb Bart's hydrops fetalis. This disease is caused by deletion or inactivation of all four alpha-globin alleles, leading to a severe deficiency in alpha-globin chains of Hb, and to the production of gamma-4 tetramers (Hb Bart). 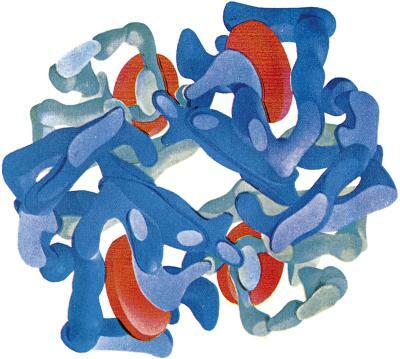 Hb Bart tetramers have an extremely high oxygen affinity and are incapable of effective tissue oxygen delivery. Severe tissue hypoxia is the direct consequence. Viral infections is also a frequent cause of hydrops fetalis. In fact infections lead to fetal anemia (hypoxia) and serum iron deficiency due to a condition of inflammation in which cytokines like IL-6 stimulate the liver to produce increased amounts of hepcidin, ormon responsible of the internalisation of ferroportin molecules, which prevents release from iron store, producing an increase of ferritin. So when a cell is deficient in oxygen or iron, it produces HIF, hypoxia-inducible factor, a transcription factor. The HIF heterodimer consists of two subunits: an α-regulatory subunit, which is the oxygen- and iron-responsive component, and the β-subunit, which is constitutively expressed. In the presence of oxygen, the hydroxylation of HIF-α at conserved proline residues within the oxygen-dependent degradation domain is the rate-limiting step for subsequent HIF-α protein degradation and is catalyzed by prolyl-4-hydroxylase domain enzymes (PHDs). PHDs are iron- and 2-oxoglutarate–dependent dioxygenases utilizing O2 as a substrate, 2-oxoglutarate as a cosubstrate, and iron (Fe2+) and ascorbate as cofactors. The 4-hydroxyprolines are subsequently recognized by the protein von Hippel–Lindau (pVHL) E3 ubiquitin ligase, which targets HIF-α for degradation by the proteasome. When O2 is scarce, or under iron-deficient conditions, the activities of PHD and factor inhibiting HIF are inhibited, thus enabling HIF-α to escape degradation and translocate to the nucleus where it dimerizes with the constitutive subunit HIF-1β. The HIF heterodimer then binds within the DNA regulatory promoter or enhancer regions of target genes at specific locations termed hypoxia response elements (HREs) and stimulates the release of VEGF, among other functions (including modulation of erythropoeisis). 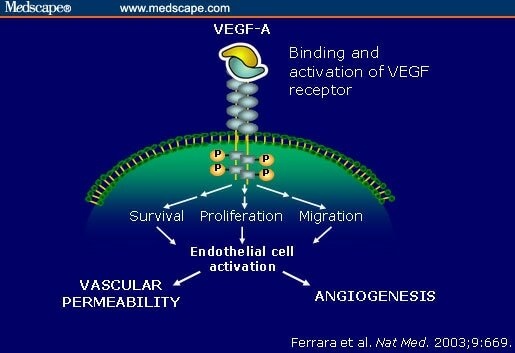 Circulating VEGF then binds to VEGF Receptors on endothelial cells, triggering a Tyrosine Kinase Pathway leading to angiogenesis. VEGF ability to enhance microvascular permeability is one of its most important properties. In fact, it is one of the most potent vascular permeabilizing agents known, acting at concentrations below 1 nmol/L, and with a potency some 50,000 times that of histamine. So, the enhanced microvascular permeability causes plasma leakage in the peritoneal and other body cavities, leading to edema, ascites accumulation that can reach massive proportions, and anasarca, proper to hydrops fetalis, is the final common denominator. Symptoms depend on the severity of the condition. More severe forms like Hb Bart's hydrops fetalis may cause breathing problems, bruising or purplish bruise-like spots on the skin, heart failure, severe anemia, severe jaundice and total body swelling that interfere with how the body organs work. The precise incidence of hydrops fetalis is difficult to elucidate, because many cases are not detected prior to intrauterine fetal death and some cases may resolve spontaneously in utero. The best estimate for how common hydrops fetalis is in the United States is approximately 1 in 600 to 1 in 4000 pregnancies. Hydrops fetalis is much more common in Southeast Asia. The best figures come from Thailand, where the expected frequency of hydrops, from homozygous alpha-thalassemia alone, is 1 in 500 to 1 in 1500 pregnancies. Accurate figures from the Mediterranean region are not available; however, the commonness of glucose-6-phosphate dehydrogenase (G-6-PD) deficiency and of defects in alpha-chain hemoglobin production in several populations from this region lead to the suspicion that the incidence of hydrops in that region is much higher than it is in the United States. 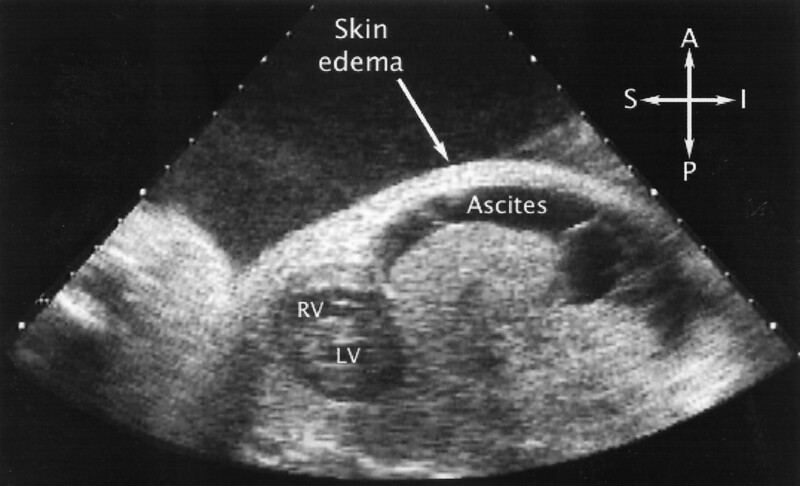 The disease is usually diagnosed on ultrasound at 22 to 28 weeks gestation and can be suspected in at-risk pregnancies at 13 to 14 weeks gestation when increased nuchal or placental thickness, and increased cardiothoracic ratio are found. The main differential diagnosis is hydrops fetalis without alpha-thalassemia, which is a common non-specific sign of numerous fetal or maternal disorders. Ultrasound. A diagnostic imaging technique that uses high-frequency sound waves and a computer to create images of blood vessels, tissues, and organs. Ultrasounds are used to view internal organs as they function, and to assess blood flow through various vessels. Amniocentesis. Involves withdrawing some of the amniotic fluid for testing. Treatment of hydrops depends on the cause. During pregnancy, hydrops may be treatable only in certain situations. Early delivery may be recommended. Infants with the Hb Bart's hydrops foetalis syndrome almost always either die in utero (23-38 weeks) or shortly after birth, although few cases have been described in which the neonate is given intensive life-support therapy and treated with blood transfusion. Treatment is controversial since treated infants surviving the immediate postnatal period show abnormal subsequent development. These patients may be considered for hematopoietic stem cell transplantation. • Removal of excessive fluid from spaces around the lungs and abdomen using a needle.